We have the pleasure of offering this clients boat to the market, this is a genuine one off sale, having bought the boat from ourselves in 2006 he used the boat one season, did 15 hours in it, then we winterized it and the boat as been stood indoors since, in an heated building! Spec Wise the boat has everything you could want as a skiing, or watersports family. 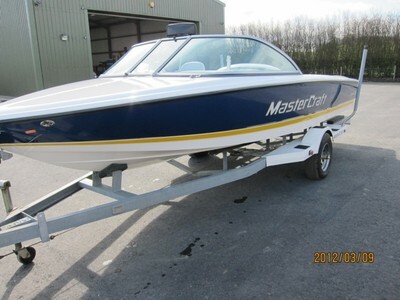 310 HP Fuel Injected engine, including Fly by wire technology for ultimate driving feel Clarion Stereo system with drivers remote Full Custom UK Trailer Full overall Cover The EVO hull which is the very same hull that the current MasterCraft Pro Star 190 model comes with. Great all event wakes and superb comfortable drive, makes this boat a very desirable package indeed! The client is keen to sell and as such, instructed us to sell at a very, very keen price, so grab yourselves a summer holiday bargain. The boat will also go through our workshops and receive a full service prior to the sale, paid for by the client!!! The boat can be viewed and water tested at our showroom / workshop location in Wetherby, West Yorkshire. Payment is required in full prior to collection.